If running smoothly, the Kansas budget should not attract attention outside Kansas. But in recent weeks, the Kansas budget has been featured in many articles by national news sources — from media staples like The Wall Street Journal and The New York Times, to niche sources like The Christian Century. Why? Because Kansas has strayed far from normal budget practices. Among the 50 states, Kansas is an extreme outlier on the spectrum — and that attracts attention. In 2012, Kansas cut its income stream so severely that revenue no longer comes close to covering the state’s basic expenses. For the fiscal year that just ended on June 30, Kansas made up the difference between income and expense by drawing down the state’s savings account. However, the income and expense gap is growing very quickly. The state’s savings account will be tapped out before this fiscal year is over. A very serious budget situation is upon us right now. → Start with this piece from Governing Magazine, “What’s Wrong With Kansas Tax Reform,” (April 2013). This dates back more than a year, but even by then — well before Kansas experienced the full effect of the new tax policy — experts representing both left and right ideological perspectives were saying that the Kansas approach to tax reform was the “worst” in the nation. → A New York Times column “Yes, If You Cut Taxes, You Get Less Tax Revenue,” (June 27, 2014), gives a detailed and clear account of why Kansas tax policy isn’t working. → The Washington Post, “Tax cuts In Kansas have cost the state money, and job creation’s been terrible,” (June 27, 2014), discusses what the tax policy has meant for jobs. Look especially at the chart. 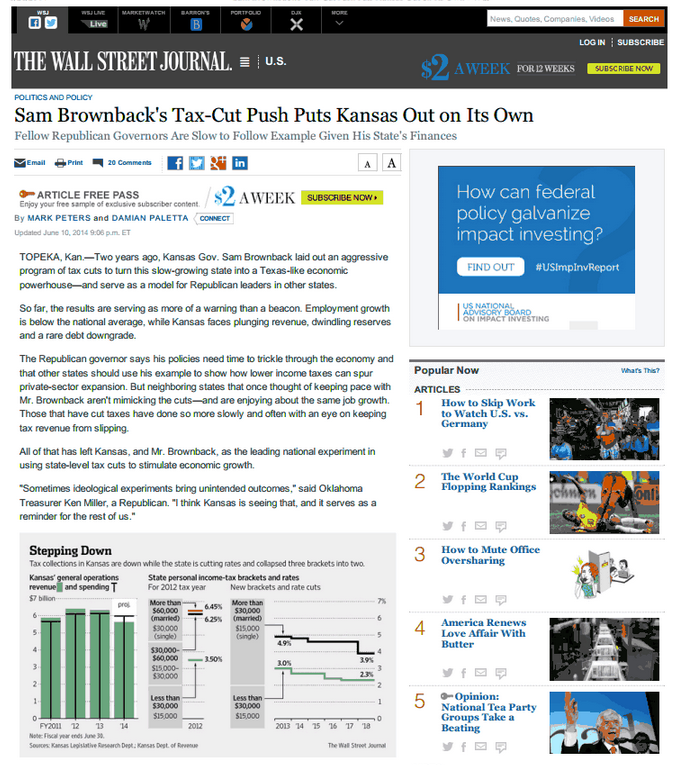 → The Wall Street Journal “Sam Brownback’s Tax Cuts Push Kansas Out on Its Own,” (June 10, 2014), reports that the Kansas situation is a “warning” rather than a “beacon” to other states. → The New York Times columnist Paul Krugman, a Nobel prize-winning economist, takes on the rationale for the Kansas policy changes in a particularly hard-hitting piece “Charlatans, Cranks, and Kansas,” (June 29, 2014). → Vox.Com, a relatively new but growing online national news outlet, gives us an account of how the Kansas tax policy came to be and the effect it is having: “Kansas was supposed to be the GOP tax-cut paradise. Now it can barely pay its bills.” (July 8, 2014). 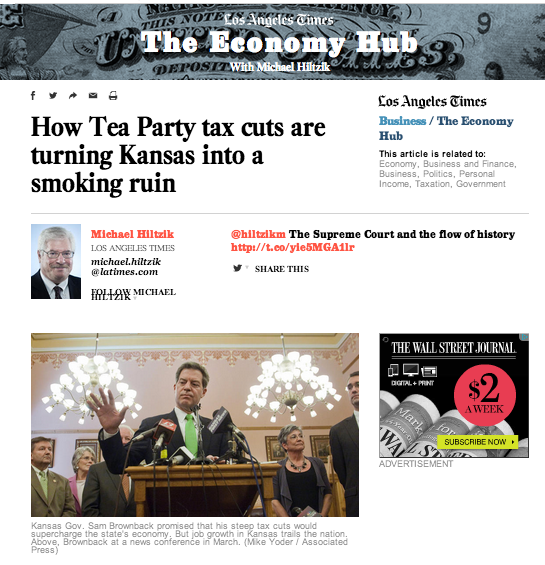 → From the Los Angeles Times: “How tea party tax cuts are turning Kansas into a smoking ruin,” (July 9, 2014). The article admonishes other states to look carefully at Kansas and then “run the other way. → And yesterday the New York Times editorial board excoriated the administration of Gov. Brownback: "Kansas’ Ruinous Tax Cuts" (July 13, 2014). The board writes: "There was only one reason for the state’s plummeting revenues, and that was the spectacularly ill-advised income tax cuts that Mr. Brownback and his fellow Republicans engineered.". The Christian Century is right. The potent budget problems Kansas now faces did not result from a recession or some other uncontrollable circumstance. Through our present set of leaders, Kansas chose this situation.